Johnny Sexton has revealed that the senior Ireland players approached Joe Schmidt before the 2018 Six Nations to voice their ambition to claim a Grand Slam. Sexton had won back-to-back titles in 2014/2015, but a clean sweep had eluded him and all the other players bar Rory Best and Rob Kearney, who were members of the team that clinched a memorable Grand Slam in Cardiff in 2009. Ireland won all five of their games last spring to achieve the accolade, and delivered their most complete performance in the final game against England at Twickenham. Speaking at last night's Irish Independent Sportstar awards, where Sexton won both Sportstar of the Year and Magic Moment of the Year for his dramatic drop goal in Paris, the Ireland out-half revealed just how much he wanted to win a Grand Slam. While publicly, the Irish coaches and players played down talk of a Six Nations clean sweep, privately, Sexton and a number of senior players met with Joe Schmidt to state their goal. "We had targeted the Grand Slam," Sexton admitted. "We had won championships and Joe doesn't let you get too far ahead of yourself but the senior player group said to him, 'listen, we want to win a Grand Slam'. "A lot of us said it, you need to go in numbers to Joe, you can't go as one. Five or six of us said it to him and said, 'look, we have been targeting championships and that is great, but what is really special in Ireland is a Grand Slam'. There had only been two before us. We really wanted to win one. He allowed us one meeting where we said to the younger guys that everything this year is about the Grand Slam. "From that moment on, we took it one game at a time and we weren't allowed mention it again. We didn't even mention it before the England game. That's what made it so special. Even after the drop goal against France, it was because we targeted the Grand Slam." Sexton (33) was awarded Magic Moment of the Year for his incredible drop kick against France in Paris during Ireland's first game of the 2018 Six Nations. That single moment set Ireland on their way to Grand Slam victory in a remarkable year for Irish rugby. 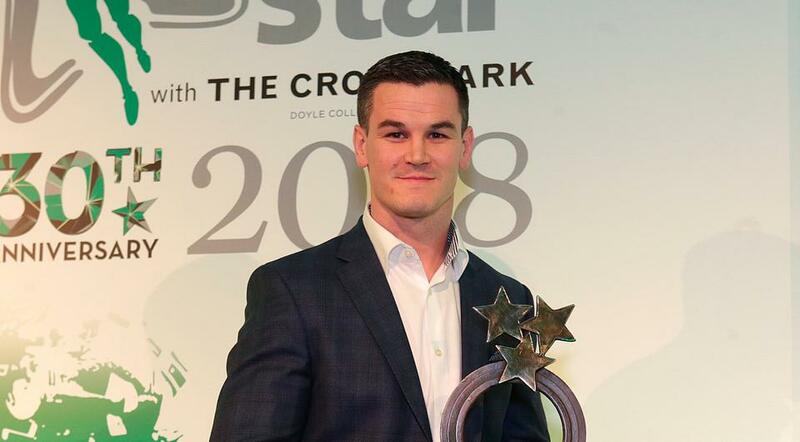 Sexton, who attended the glittering awards ceremony in Croke Park with his wife Laura, was also awarded Sportstar of the Year. It comes after he was recognised as World Rugby Player of the Year. He said: "It's been a fantastic year, hopefully 2019 will be just as great. "We dream about seasons like this and you have to pinch yourself sometimes to realise that it's all happened. "I'm looking forward to the new season, the Six Nations and the Heineken Cup and obviously into the World Cup." The women's Irish hockey team were recognised with the Team of the Year award after they claimed a silver medal in the Women's Hockey World Cup. Forward Deirdre Duke told the Irish Independent that this year had been "a whirlwind". "The reception we got when we arrived home to Dublin after the World Cup was just incredible and to be invited to awards nights like this, it isn't something we are used to and it's lovely. "We are grateful for the recognition and for the growing support of the Irish public. "We have never qualified for the Olympics before so that's a huge task ahead of us." Deirdre, from south Dublin, currently plays for Dusseldorf but she's returning home within the coming months to train as a solicitor. Meanwhile, former Ireland goalkeeper Packie Bonner was in philosophical spirits for the year ahead as he accepted the Hall of Fame award in recognition of the Euro 1988 soccer team. Packie will always be remembered for his heroic performance for Ireland's 1-0 win over England in Stuttgart. "Soccer is up there with the great Irish sports and it always will be," Packie said. "Sometimes you go through periods where you don't play well but we went through exactly the same in 86 and 87, as we are now and we had great players. "Suddenly Jack came along and then we qualified and our success went on for 10 years. "We had a bit of dip and then Mick came along and we qualified again. "And I have no doubt with Mick taking over we will get back to where we were before. "We need great football to lift us up. The sport can bring us together even during tough times like Brexit. It can happen for us again and I think Mick is the man to do it." Runner Sarah Healy (17) was recognised as Young Sportsperson of the Year and she said she never expected the success she enjoyed this year. Sarah, a two-time gold medalist from the European under 18 Championships, is currently studying for her Leaving Cert at Holy Child secondary school in Killiney. "I ran well and didn't let the pressure get to me. I'm in sixth year at the moment, so it's definitely really busy. But running is also a break from school and it's habit, something I have always done. "My main goal next year is to go the European juniors and to do well in my Leaving Cert."